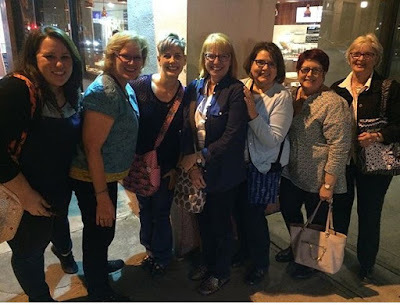 There are so many pictures to share when it comes to QuiltCon, and I didn't want to clog my Instagram feed, so other than my own quilts, I haven't shared any any pictures. The recap will be broken up into two parts. Tomorrow I'll show you some of my favorite quilts. Today I'll show you some of the people I met. I hope you will indulge me. 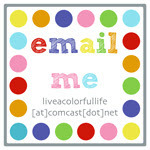 I have started making a hardcover print copy of my blog at the end of the year ((blog2print.com). It's a good review of the year for me since I no longer do any scrapbooking, and I hope my grandchildren will enjoy paging through the books someday. In this age of Instagram, I'll be referring to everyone by their Instagram name. First of all, Pasadena is only about four hours from our house. And in the 38 years we have lived in Fresno, I have never driven to the L.A. area by myself. Mark does the driving. I watch the scenery. It was sprinkling when I left Wednesday morning. And also, I love my Garmin GPS (my car is a 2008 Pilot--so no fancy navigation system). My room at the Sheraton was really close to the convention center. The quilt show and vendors did not open until Thursday morning. Registration was open at 5 p.m. and right off the bat, I met Cath Mosely. I might have gushed a lot a little. Her solid version of Jen Kingwell's "The Gypsy Wife" makes my heart sing. Also, I have a stack of solid purple fabric because her "King George III" blocks are amazing. Follow her on Instagram (@cathmosely). No. Seriously. Follow her. 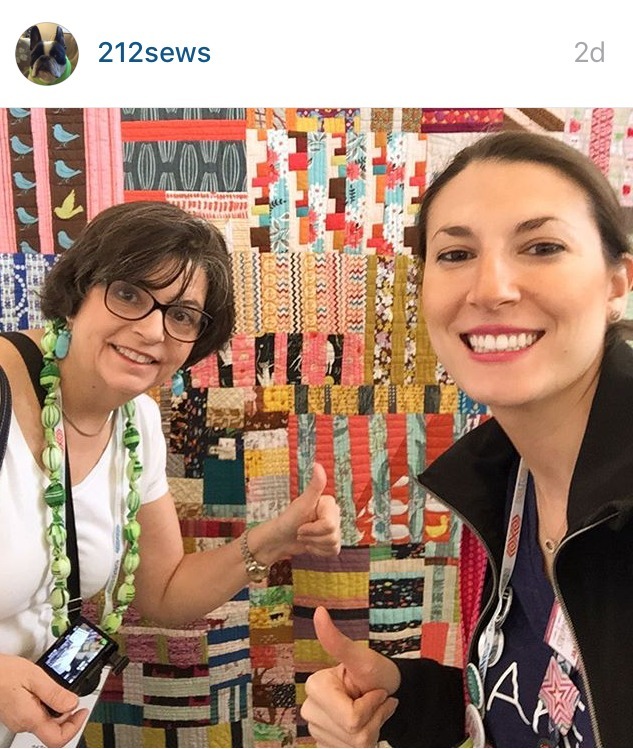 At the very least check out her hashtag #kinggeorgeIIIquilt." You will see what I mean. So last year, I met Alyson (@212sews) and her mother Jean (@212sewstoo), from New York. They are the coolest. And they sew together nearly every week. So it was fun to spend some time with them. It's easy to grab a group of people, even if they don't all know each other, and have a meal together. Brownies with bacon. Decadent. Even with seven of us, we didn't finish it. 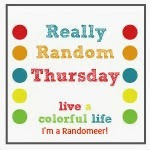 You learn to take advantage of random sightings, even if you have communicated with each other ahead of time, because there are so many people. And so little time. This was the only selfie--the one time there was no one around to snap a picture. 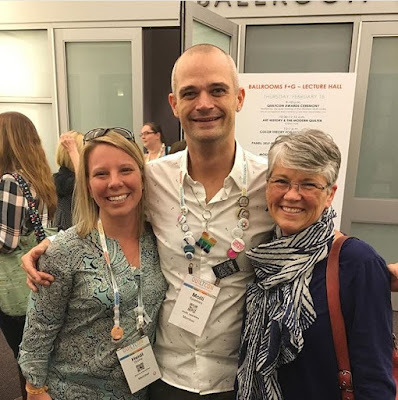 I look so lopsided...but I kind of don't care because this is Sandi Hazelwood (@craftyplanner), and I'm a HUGE fan of her Crafty Planner podcast. C&T held a meet and greet on Friday. I was in between classes so I didn't have much time. But I did have enough time to find Chawne Kimber (@cauchycomplete). Carrie Hanson (@gotchacoveredquilting). Gotcha Covered is a great online fabric store. Felicity is such a good friend and I'm so glad we had time for lunch rather than just a quick hi-goodbye. And I was finally able to meet M-R Charbonneau (@quiltmatters), although I would really love to call her Michele-Renee, because I think her name is so beautiful....and she is too. I took a couple of classes. One was basic EQ7. Now before I forget everything I learned, I need to open up that laptop again and start playing around with it. And I took "The Weight of Love" by Libs Elliott (@libselliott), all about Y seams. I'm fairly proficient on Y seams, but I was just so curious about Libs. She is really lovely and softspoken, and so very nice. It was a great class. She also gave the most interesting lecture the next day. So quite a few years ago, I sent some fabric to an etsy shop owner, and she made me a raincoat. The fabric was Anna Maria Horner's laminated cotton, and the lining was from her Garden Party line. I took the raincoat to Pasadena with the specific purpose of stalking her trying to find her to see if she would autograph the lining. Well, of course it did rain a bit Wednesday on the way down. So it was a really good thing I had it along. Anyway...she signed it! And even drew some raindrops. Love, love, love! I had wonderful roommates, Heidi (@buttonsandbutterflies) from Utah, and Linda (@lkhomework) from the Santa Maria area. Oh, wait. This picture is misleading. Josh (@mollisparkles) did not room with us. In fact, I wasn't even around when this picture was taken, and I was disappointed that I wouldn't get to meet him. But wait. I was having coffee the next morning with Kristi Owens (@71stitches). 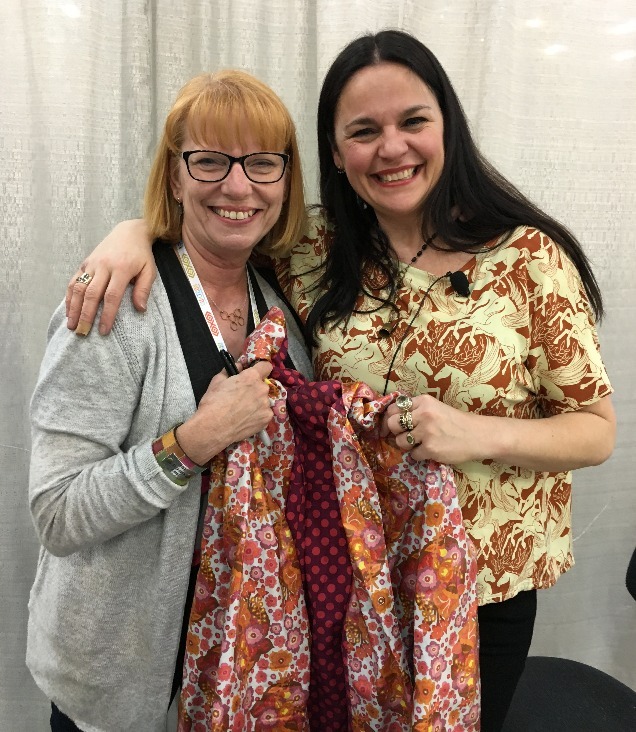 She had made the Moccasin quilt with all the wonderful neutral fabrics, and she generously gave me the list of fabrics so I could totally copy her, so I definitely wanted to thank her in person for all her help. Anyway, we turned the corner after our coffee time, and there was Molli. Oh, and I had a glass of wine with Adam Levine! Kidding. But I bet I made you look twice! He is actually the son of the owner of one of my favorite quilt shops on the Central Coast, Quiltin' Cousins. He was so nice. And I didn't even see him visibly roll his eyes when I asked for this picture. Another social part of QuiltCon is the exchanging of buttons. This is what I came home with. I want to make a mini to pin them to. See the quilt in the background? It was made by Jenn Rossotti (@jennrossotti), who lives about 30 minutes away from me. And we didn't meet until Pasadena. The quilt is made from the new Hoffman Indah line and it is stunning! And it's just a little taste of all the beautiful quilts that were part of QuiltCon 2016. See you back here tomorrow. Looks like you all had a marvellous time! Wow what a lovely time. 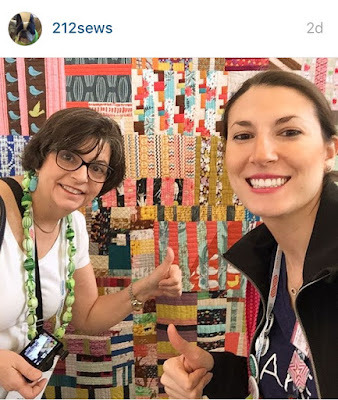 I've never been to a quilt conference but your post makes me want to go! Always nice to put a face with a name, and you've given me some more people I need to my Instagram feed. Glad you enjoyed it! The quilts and vendors were amazing, but the people were the best. Glad to have spent some time with you, Cindy. So many people so much fun. Half the group at your one dinner I know from the Denver Metro guild I belong to. Stephanie, Christine (her IG is ccpquilt) and Wendy. . . . why wasn't I there? Since I'm probably never going to get there, it is fun to see what I am missing out on! All the hearts to you, my friend. Wow Cindy - it looks like you had a great time. What fun to meet all those people that you've followed for ages. Thank you for all the photos - it brings it alive for those of us who didn't attend. The people are just as important as the quilts, so they rightfully deserved their own post. I'm looking forward to tomorrow's post about the quilts. I have a favourite from what I saw online - I wonder if we picked the same one? I suspect we might have. What a great post! Almost like being there! Looks like you had a blast. It looks like you had a great time, even with the trepidation of the crowds and people before you went. I'm fascinated by Libs Elliott, soft spoken you say? I will have to check out her instagram feed. What a great post. Wish I could have attended. Not bad for a self proclaimed introvert, eh? And thanks for the button you gave me when I came up to say hello in Rubio's during lunch. Great post, thanks for sharing. So great to have had a chance to sit and visit before the whirl wind of QuiltCon that first night. Funny that I didn't realize Linda was your roommate, I was happy to have finally met her in person. We met many of the same peeps but you did a much better job of capturing. Time to decompress. Wow, my friend, the introvert, is a friend magnet! Seriously, you have such a gift with people, and I love seeing all the connections here. What a fun time! Finally surfacing after a nasty bug post-QuiltCon to see this lovely post. It was so great to meet you in person, Cindy! Love that photo of us (may borrow it for my post, if you don't mind). :) Hope we can hang out a bit more next year!